We now learn of another fire that is somewhat in-between the two types of fires. In October, Philip Coates from Yorkshire parked his Model S 70 at his mother’s house without plugging in the vehicle for charging. He told Electrek that about an hour later, he realized that his Model S was on fire and called the local fire department. They were able to extinguish the fire since extraordinarily, the battery pack didn’t catch on fire which would have been much more difficult to stop. Coates’ insurer investigated and told him that they tracked the origin of the fire to a “condenser for the BMS” located behind the bumper – near the wheel well. Since the vehicle was under warranty, Coates assumed that Tesla would pay to have it replaced, but the company wouldn’t and instead claimed that the cause was most likely damages that occurred in an accident prior to the fire. He said that even the Autopilot worked despite the radar being located in the front bumper. Only the parking sensors were not working. Ultimately, the repairs were completed on September 23rd and were mostly aesthetic in nature. 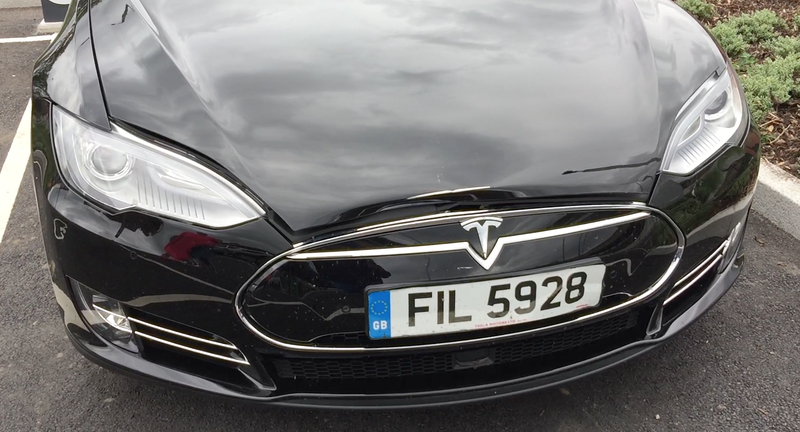 The Model S caught fire 2 weeks later on the 8th of October 2016. More time passed between the accident and the repairs than between the repairs and the fire. Coates says that his insurer dismissed the idea that the fire was caused by damages that occurred during the accident. Nonetheless, they paid Coates back and he was able to buy a new Tesla. The only other instance of a fire that comes close to those circumstances was a Model S that caught fire earlier this month in Shanghai while it was parked at a Supercharger without charging. Tesla is still investigating the cause. As usual, it’s important to note that car fires are not exactly unique to electric vehicles. Ford just had to recall 570,000 vehicles due to a risk of engine fires. It sounds like this doesn’t apply anymore?